One of the things I love most about my job as a Librarian at Kleb Intermediate School is the opportunity to collaborate with teachers from different academic departments. This week I will be facilitating a Breakout EDU activity with 7th grade Science classes to review their knowledge of Cells. I discovered Breakout EDU a couple of years ago in an article that I read in the September 2016 issue of School Library Journal. The article described a game model based on the popular Escape Rooms where people go and spend an hour looking for clues and working as a team to “break out” of a locked room. 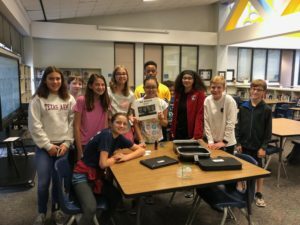 With a Breakout EDU kit, students used critical thinking and their knowledge of curricular content to solve puzzles and gather clues that would help them “break into” the locked Breakout EDU boxes. It looked like such a fun way to engage students and partner with teachers that I had to give it a try. I purchased two kits and started to look for a teacher who might like to try this new game style activity in the library. I didn’t have to look very long! Ms. Jackson’s ELA class had just finished reading The Outsiders by S.E. Hinton. Breakout EDU had a game for this novel! She agreed to collaborate with me on the activity and bring her classes to the library to give it a go. I was so surprised by what I saw! Students who usually shy away from participating in class were actively engaged in looking for clues. Quieter students were sharing their thoughts. The students quickly realized that to be successful, they had to work together and listen to everyone’s ideas. The activity was a HUGE hit! I began looking in Eduphoria to see what was coming up in the curriculum for other subject areas and found Breakout activities I could try with Social Studies, Science, and Math. I was able to partner with at least one teacher from each subject area. Some of the teachers were a little reluctant at first, but once they saw how engaged their students were, they were sold. 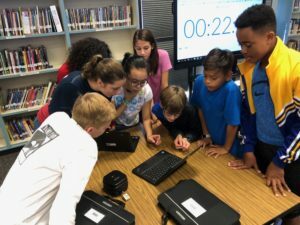 Breakout EDU has games for Elementary, Middle, and High school in the core subject areas of Reading/Language Arts, Math, Science, and Social Studies as well as some electives such as the Arts, Career and Technical Ed, Computer Science, and Physical Education. It has not only been a fun way for students to review content, but it has also been a fantastic tool in which to collaborate and build relationships with teachers on my campus. Goerner, Phil. 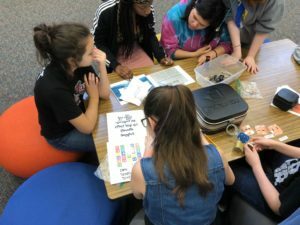 “Breakout EDU Brings.” School Library Journal. N.p., 7 Sept. 2016. Web. 18 Sept. 2018.